Democratic presidential candidate Hillary Clinton waved to members of the audience after speaking at a rally on Saturday. WASHINGTON — Lock her up! Guilty! The prime-time refrain all week at Donald Trump’s Republican National Convention in Cleveland had the subtlety of a freight train rumbling along Lake Erie. And for Democrats fretting about the vulnerabilities of their own presidential nominee, it served as a Klaxon warning. These were not just ravings from diehard Clinton haters. They were the over-the-edge manifestation of a real problem Democrats face: The former secretary of state must strive at her own convention, beginning Monday in Philadelphia, to win the trust of middle-of-the-road voters from Ohio to Florida. Polls show that Clinton heads into the Democratic National Convention this week with a wide swath of Americans saying they don’t trust her, or particularly like her. There’s the private e-mail server. Her career as a Washington embed. The big-money influence of the Clinton Foundation. Her struggles to connect on a human level. The Clinton campaign now has a four-day prime-time opportunity to shine up her image, while showcasing a party that’s united and on message, in contrast with the discord and disorder Republicans regularly displayed in Cleveland. Propelling Clinton was a steely determination that’s been one of her most consistent traits in 25 years of public life. 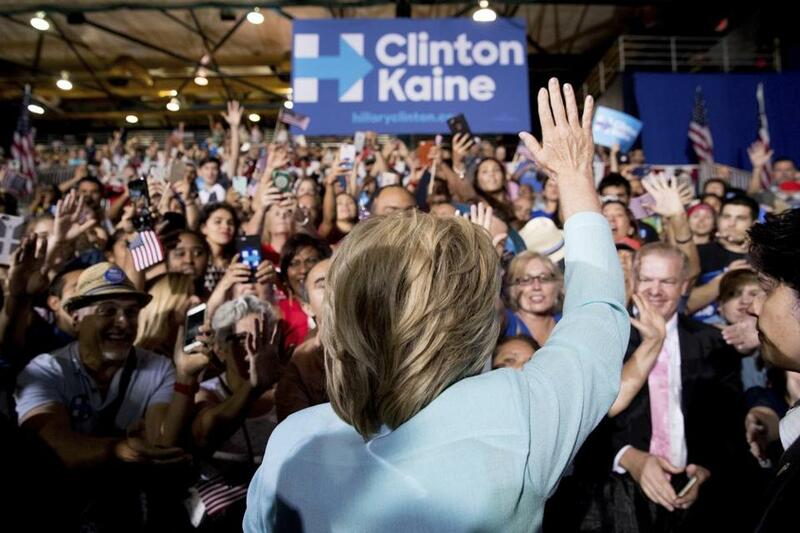 Read: Clinton, Kaine debut in Fla.
People who have worked with the Clintons for years say the former secretary of state and her team know exactly how to use a forum like this to present a carefully curated story aimed at drawing in skeptical voters. “The Clintons have been on a talk show set their whole professional lives,” said Josh King, a former Clinton aide who helped organize the 1992 and 1996 Democratic conventions and did advance work for major Clinton trips during a two-decade-long career producing political events. “They realize that the convention is a forum that is about having other people tell great stories, and allowing other people’s stories to do the work for you, instead of telling your own story,” King said. Democrats have assembled a list of speakers dotted with people who can highlight Clinton accomplishments and causes that may not immediately spring to mind for the average voter. The list of “everyday Americans” who will speak includes, for instance, a disability rights advocate with cerebral palsy who first met Bill Clinton as a student during a 1993 White House event and students from the Eagle Academy of New York City, a school for at-risk young men of color that then-Senator Clinton supported as it got off the ground. There also are some higher-profile figures who will take the podium to help the country get to know a better side of Clinton, people like President Obama and Michelle Obama, both very popular among Democrats and those likely to vote Democratic. On Tuesday, Bill Clinton — a.k.a. the “communicator-in-chief” whose 2012 speech is credited with helping make the case for Obama’s reelection — gets a prime-time speaking slot. Their daughter, Chelsea, will speak before Hillary Clinton delivers her own acceptance speech Thursday. Party analysts insist there’s still room — with so many eyeballs trained on this event — to tell voters a new story about someone who has been in the national eye for nearly 25 years. “She’s the least-known best-known political figure in the nation,” said Joe Trippi, a Democratic strategist who was 2004 Democratic presidential candidate Howard Dean’s campaign manager. “There’s a real opportunity to introduce her to the country in ways that will surprise” voters and could get the skeptics to “open up a bit and consider her,” he said. While last week’s GOP convention was messy, with party divisions front and center, Republicans nonetheless got a lot of airtime to bang away at one of Clinton’s biggest vulnerabilities: her trustworthiness. Recent Quinnipiac polls in battleground states of Virginia, Colorado, and Iowa found a majority of voters there do not think Clinton is honest and trustworthy, and only about half of voters in Florida, Ohio, and Pennsylvania say they trust her. Throughout the week, Republican speakers blasted her record as secretary of state, arguing her decisions sowed violence and instability around the world; they accused her of breaking the law and lying over the use of a private e-mail server as secretary of state, which earned Clinton a harsh rebuke from the FBI but no criminal charges. Democrats want to draw a contrast not just between a Trump they view as dangerous and divisive and a steady, unifying Clinton, but also between the Democratic Party and the version of the GOP Trump now leads. The speaker list of political figures, average Americans, and even Hollywood stars seeks to play up themes of diversity, with an array of races, genders, and walks of life featured on stage. The week ahead is not without potential pitfalls. Some supporters of Bernie Sanders, the Vermont senator who mounted a surprisingly strong challenge to Clinton for the Democratic nomination, remain suspicious at best of Clinton. Nineteen hundred of them are delegates to the Democratic convention, and it is entirely possible that procedural skirmishes could erupt in Philadelphia as they did in Cleveland. Exacerbating ill-will on the left was a one-two punch Friday. First, e-mails from top DNC officials leaked by hackers inflamed feelings among Sanders supporters that the Democratic Party did not treat their candidate fairly. 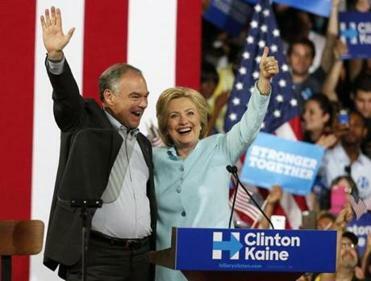 Then Clinton announced she had chosen Senator Tim Kaine of Virginia as her running mate, a trade-supporting, centrist pick that many progressives viewed as a slap in the face. On Monday, the Democratic platform, which became a focus for Sanders and his followers, goes to the convention floor for a vote. Sanders extracted some key concessions — the platform now includes support for a $15 per hour minimum wage and a call to break up banks that are “too big to fail,” and embraces a modern-day version of the Glass-Steagall Act that would constrain what banks can invest in. All were issues Clinton was resistant to during the primaries. Sanders is set to meet with his 1,900 delegates at the convention center on Monday afternoon — and later he will deliver a speech he spent the weekend crafting, according to his campaign manager, Jeff Weaver. Sanders likes to write them out longhand on yellow legal pads, he said. “It’s the first night of the convention. It will be the start of it, and I think it will really set the tone,” he said. Also on the program that night is Senator Elizabeth Warren of Massachusetts, who withheld her endorsement of Clinton for months and was passed over for vice president. Throughout the week, Sanders has a number of other forums planned — with 500 to 700 expected at each. They’ll include a meeting designed to encourage progressives energized by the Sanders campaign to run for office. The Clintons have been here before, confronting image issues, starting with the 1992 convention. That event became part of an ultimately successful strategy to overhaul voters’ negative impressions of then-candidate Bill Clinton as a shifty, philandering draft-dodger. A centerpiece of this was a biographical video, “A Man from Hope,” shown at the convention that emphasized Clinton’s dirt-poor beginnings and his determined hard work to achieve the American Dream, and help others to do the same. Hillary Clinton got a lot of screen time in that film, sharing humanizing anecdotes of her husband as an idealistic young law student and a doting father. Bill Clinton emerged from the convention with a 16-point boost in the polls. Victoria McGrane can be reached at victoria.mcgrane@globe.com. Follow her on Twitter @vgmac. Annie Linskey can be reached at annie.linskey@globe.com. Follow her on Twitter @AnnieLinskey.